The contentious debate over how to use New Orleans tourism tax dollars that has rumbled along largely behind closed doors spilled out in public Wednesday at The New Orleans Advocate’s tourism summit. A high-level panel that included Mayor LaToya Cantrell’s chief of staff, John Pourciau, and Stephen Perry, chief executive of the tourism promotion organization New Orleans & Co., made impassioned pleas on both sides of the question: What is a fair distribution of taxes imposed to benefit New Orleans’ tourism industry? The backdrop of the summit was the long-running debate between the Cantrell administration and tourism officials over Cantrell’s request that a greater share of hotel tax revenues go toward rebuilding the city’s crumbling infrastructure and supporting the financially strapped Sewerage & Water Board. Perry and others from the industry see any watering down of their tax stream as threatening investments needed to keep New Orleans competitive as a tourist destination. The mayor and others have argued that some of those taxes ought to be aimed at repairing infrastructure and making the city safer, which will help the tourism industry along with residents. The debate has been fueled by reports from the Bureau of Governmental Research, an independent public-policy think tank, arguing that New Orleans is an outlier compared with other municipalities in how the city’s taxes are divided. For instance, in a recent report, BGR pointed out that the city’s 1 percent hotel tax has been suspended for the past 53 years in favor of diverting tax money, through a byzantine state-level system, to various tourism-related groups, including the entities in charge of the Mercedes-Benz Superdome and the Ernest N. Morial Convention Center. With New Orleans hotel taxes forecast to generate $200 million this year, an estimated $150 million would go to the Superdome, the Convention Center and efforts to support tourism marketing, while the city’s share would be below $19 million, the BGR report said. 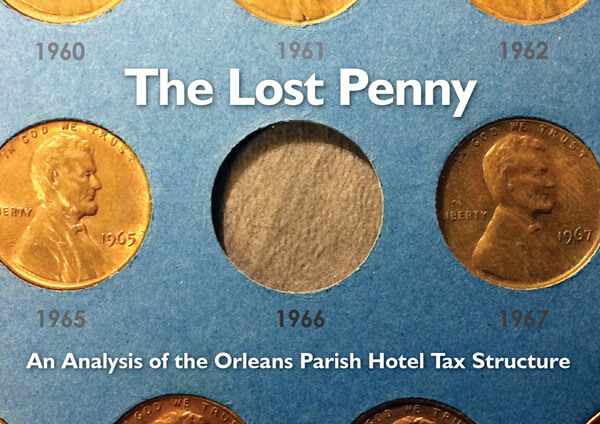 The report argued that “the lost penny” from the suspended city hotel tax should be at least partially restored as part of a more equitable tourism tax system. The problem of inadequate city funding requires both the tourism industry and the city to find a resolution, said Amy Glovinsky, the CEO of BGR, who served on Wednesday’s panel. “The conversation today must include … the reality of the critical need for infrastructure funding and what role the tourism entities should play in responding to this problem,” she said. “The idea that there is a ‘lost penny’ is simply ludicrous,” he said. “The city was the beneficiary of the greatest deal in the history of cities: two $1 billion economic drivers built by the state of Louisiana in conjunction with the hospitality industry,” he said, referring to the original tax deals that funded the Superdome and the Convention Center. He and other panelists representing the hospitality industry, including Michael Sawaya, who took over as head of the Convention Center last year, argued that the current system should stay in place so that capital improvement projects and marketing efforts can help keep New Orleans competitive with other cities like Atlanta and Las Vegas. “Do you grow a city and its economy by putting things in the expenditure column, or do you grow the revenue column” by investing money back into the tourism industry, which generates 43 percent of the city’s sales tax revenue, Perry asked. Cantrell and tourism officials have been haggling over the funding issue for months, going back and forth over how much city residents will be asked to pay for better infrastructure and how much redirected tourism taxes will help the effort. Gov. John Bel Edwards has also stepped into the negotiations in an attempt to broker a deal that could be approved by state lawmakers in the coming legislative session. On Tuesday, The Advocate reported that a high-stakes meeting between the governor, Cantrell and tourism-industry representatives had left both sides still far apart. “The mayor has said everything is on the table,” Pourciau said during the panel, noting that the Convention Center has a capital reserve of 150 percent of its operating budget, while the city has a reserve of only 11 percent. He said that reserve is inadequate to meet the urgent needs of the city for infrastructure repairs and to improve security.